Siemon, a leading global network infrastructure specialist, has announced the expansion of its comprehensive line of copper cable with category 6A F/UTP shielded outside plant cable (OSP) to provide superior performance and support for the latest applications to outside environments. Meeting TIA and ISO performance requirements for shielded class EA/category 6A, this robust shielded cable is ideal for extending network access to outdoor satellite facilities such as temporary classrooms, offices or trailers in a campus environment and for supporting a wide range of outdoor devices such as cameras, wireless access points, point-of-sale kiosks, access control devices and emergency call boxes. Suitable for harsh and wet environments where fibre optic cable is not appropriate, the category 6A shielded OSP cable’s four pairs are segregated by an innovative separator, filled with non-conductive water-blocking gel to prevent moisture ingress and then surrounded by an inner polyolefin jacket. A rugged UV-resistant outer jacket is applied over a layer of water-blocking aramid yarns with a super absorbent polymer and an aluminium foil shield that delivers superior RFI and EMI protection. Siemon’s Category 6A F/UTP OSP cable can be used in direct burial, lashed aerial, duct and underground conduit installations, including under concrete slabs and other wet locations. Sequential measurement markings on the cable jacket and an integrated rip cord offer easy installation, and termination is compatible with Siemon’s Z-MAX 6A shielded outlets, Ruggedised Z-MAX 6A shielded outlets and TERA 7A outlets and plugs. Earlier this year, Siemon announce 40/100G fibre cabling solutions that provide a fast, simple and economical upgrade path from 10 gigabit to 40 or 100 gigabit applications. Part of Siemon’s LightHouse advanced fibre optic cabling solutions, the new solutions include a variety of equipment cords that allow customers to maintain and fully utilise their existing Siemon Plug and Play enclosures and Trunks for next-generation 40/100 gigabit performance in network, server and storage applications. To connect MTP trunk backbone cabling to active equipment via Siemon’s Quick-Pack or ultra-high density LightStack MTP adapter plates that offer easy pass-through connectivity within Siemon’s fibre enclosures, the new 40/100G fibre cabling solutions include conversion cords that transition two 12-fibre MTP connectors to three 8-fibre MTP connectors, ensuring 100 per cent utilisation of the 12-fibre MTP backbone trunks. “Current 40 gigabit transmission and upcoming 100 gigabit transmission are both based on 8 fibres, leaving 33 per cent of 12-fibre backbone trunks unused. 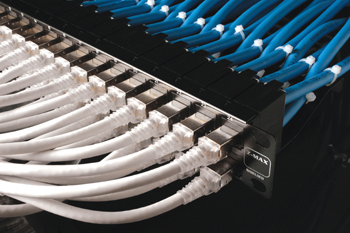 Our conversion cords transition two 12-fibre MTP connectors to three 8-fibre MTP to prevent having unused fibre,” says Charlie Maynard, fibre optic product manager at Siemon’s global headquarters. The new 40/100G fibre cabling solutions also include single MTP jumpers, conversion cords that transition two 12-fibre MTPs to one 24-fibre MTP for use with current 100 gigabit channels based on 20 fibres, and LC to MTP 4X10G hybrid cords that transition one MTP to four duplex LC connectors for use with 40 gigabit applications based on aggregation of multiple 10 gigabit ports. To upgrade from 10 gigabit to 40 and 100 gigabit applications, customers can simply swap out existing Siemon MTP to LC modules with the MTP adapter plates and then select the 40/100 equipment cords that best suits their application. The cords are made with Siemon’s smaller RazorCore cable that make it easier to access connections while reducing congestion in horizontal cable pathways for improved airflow around the equipment. Established in 1903, Siemon is an industry leader specialising in the design and manufacture of high-quality, high-performance low voltage infrastructure solutions and services for data centres, LANs and Intelligent Buildings. Headquartered in Connecticut, USA, with global sales, technical and logistics expertise spanning over 100 countries, Siemon offers the most comprehensive suite of copper and optical fibre cabling systems, cabinets, racks, cable management, data centre power and cooling systems and Intelligent Infrastructure Management solutions. With over 400 patents specific to structured cabling, Siemon Labs invests heavily in R&D and the development of industry standards, underlining the company’s longstanding commitment to its customers and the industry.